Stand out against your competitors! Let’s face it, the music industry is extremely competitive and fast paced and you want to stand out the best you can against your competitors. We are always being asked by our clients when they’re on our website, “who does Black Tie Group recommend”? Well it’s time to reward the bands that do the right thing by us and our clients and provide them with a “recommended” listing that stands out in our band lists. 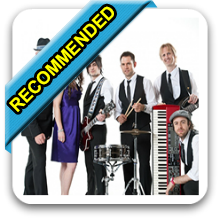 To become a “RECOMMENDED” band or performer with Black Tie Group’s Entertainment Agency, there is a particular criteria that the band must first meet, in order to stand out against your competitors in our band lists. 1 . Be a great quality act and have a complete and comprehensive listing on our website including: a video (with no band name showing in the clip), more than one demo song, a good write up about the band selling the act, a full song list and always keeps the listing up to date. 2. Have an online and up to date calendar, that we can refer to OR, the band emails us their booked dates once a week. 3. Have at least ten (10) positive feedback comments posted on your link at our website provided by a previous client. 4. Have supplied us with realistic and reasonable prices. Band prices are always up to date in our database, doesn’t try and change prices after its been quoted and always honours their previously submitted price. 5. Not make demands for meals, drinks, refreshments or greenrooms during or after a deal has been made. 6. Have a proven track record of being professional, punctual and reliable at all times. Is always polite to us and our clients, is easy to get along with, demonstrates a pleasant and helpful nature and never argues. 7. Always contacts the client the week leading up to the event (or before) and invoices the client on time as per the booking confirmation sheet. Doesn’t make extra demands directly to the client once the deal has been made. 8. Responds to all communications quickly. Reads and understands our “Are you available” emails and “Booking Confirmations”. Confirms all bookings by reply email quickly and efficiently. 9. Have proven that they can be trusted by referring repeat work back to Black Tie Group. Also refers clients back to Black Tie Group if the band knows that they have already been quoted by us and now the client is approaching them directly. 10. Always dress in appropriate attire to suit the event or function you are booked in to. 11. Have never double booked themselves and cancelled our gig. If you feel that your band is already meeting all of the above criteria and isn’t listed as a recommended band, please let us know and we will review your listing.